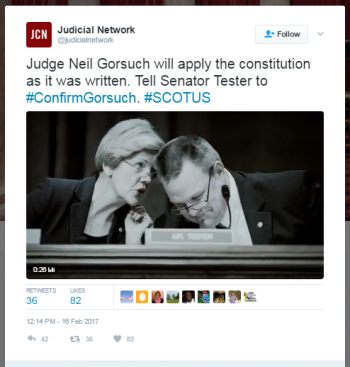 The Judicial Crisis Network, a conservative organization that led opposition to former President Barack Obama’s Supreme Court nominee, launched a $10 million multi-state advertising campaign last month to support the confirmation of President Donald Trump’s Supreme Court nominee, Neil Gorsuch. 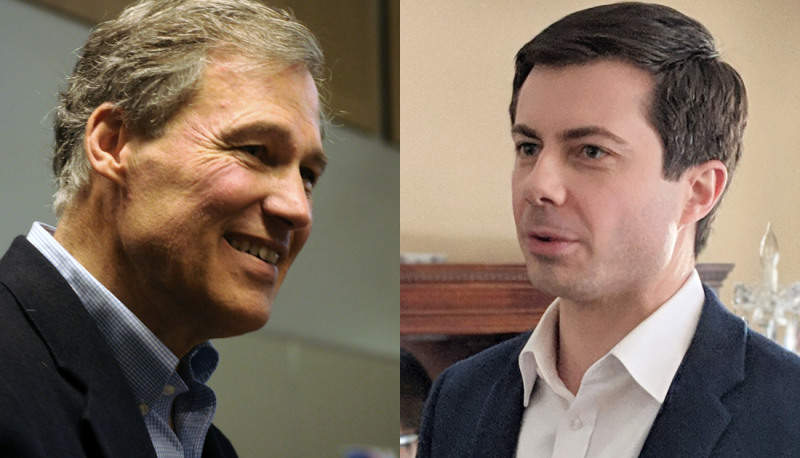 In D.C., Indiana, Missouri, Montana, and North Dakota alone the group is spending $2 million to run online and TV ads. 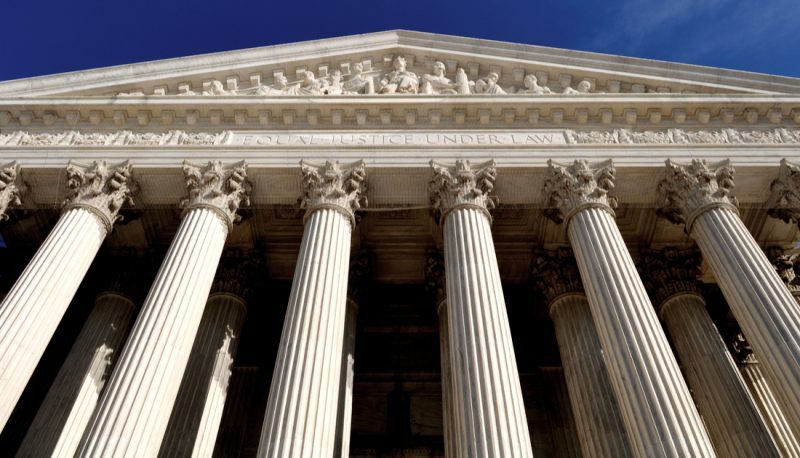 This is essentially an attack from big money donors: the Judicial Crisis Network is funded by the Wellspring Committee, which was established by the oil billionaire Koch brothers. 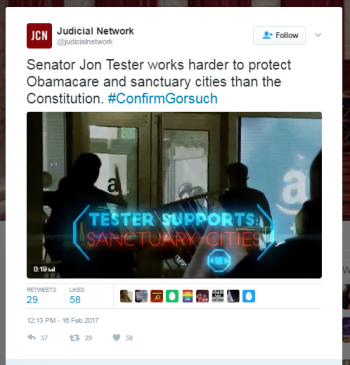 On Twitter, the group is using paid advertising to pressure Senator Jon Tester to support Gorsuch. 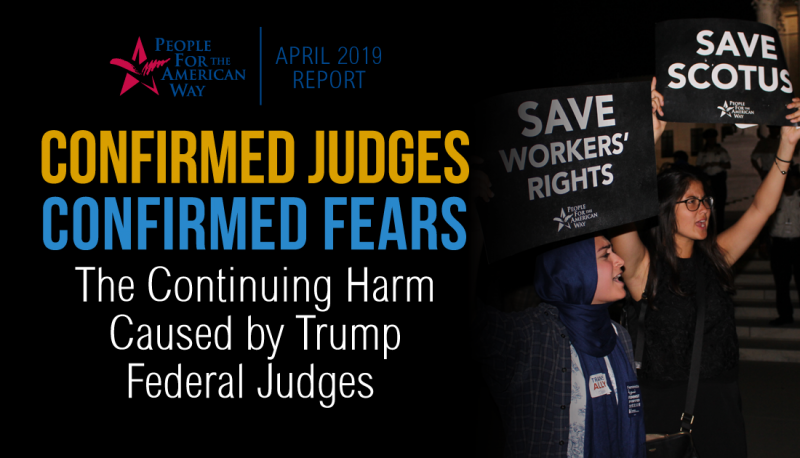 Gorsuch has a troubling record of supporting corporations over workers and defending the increased flow of money in politics as a form of free speech. Because of his record on these and other issues, Gorsuch is a disastrous choice for the Supreme Court. Senator Jon Tester, on the other hand, has a proven history of working to keep big money out of politics. He was an early supporter of a constitutional amendment to reverse decisions like Citizens United. And Tester has repeatedly affirmed that he opposes the influence of outside money in our elections, saying “We can pass bill after bill, but if we don’t stop the flood of money into politics, special interests will win at the expense of everyday Americans.” In 2014, Tester introduced a bill that would make public the names of donors who give more than $5,000 to “dark money” groups. Senator Tester has said that he is reviewing Gorsuch’s nomination and qualifications. On Wednesday, in a letter to the editor published in the Missoulian, two Montanans urged Sen. Tester to do the right thing and protect the Constitution by opposing Gorsuch’s nomination. 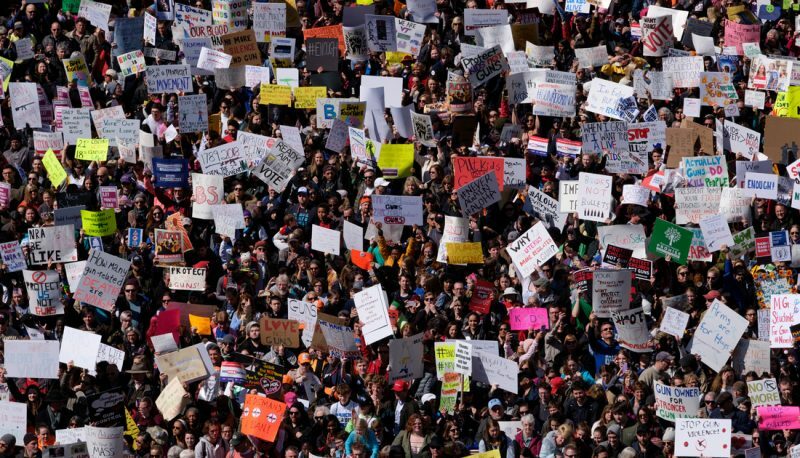 It is crucial for Senator Tester to keep up his positive record on money in politics by decisively voting against Gorsuch. Clearly, given the Supreme Court nominee’s beliefs on corporate personhood and using money as free speech, Gorsuch stands against Senator Tester’s conviction in protecting democracy for all Americans. Montana’s other senator, Senator Daines, has not been the target of this JCN campaign, but if he were truly on the side of Montanans, he would oppose Gorsuch as well.